You can call the Famous’ Nick Vitulli a “boozeier” (his word) or a bartender, just don’t call him a mixologist. He hates that. This scruffy, down-to-earth bartender has worked at The Eveleigh on the Sunset Strip and created the cocktail program at reservations-only Macallan-focused 10 Pound bar in Beverly Hills’ Montage hotel. But this past September he had a hand in opening a bar in Glendale called the Famous. It’s more his speed with an extensive, handpicked selection of whiskey, a place to park his motorcycle, and no reservations required. 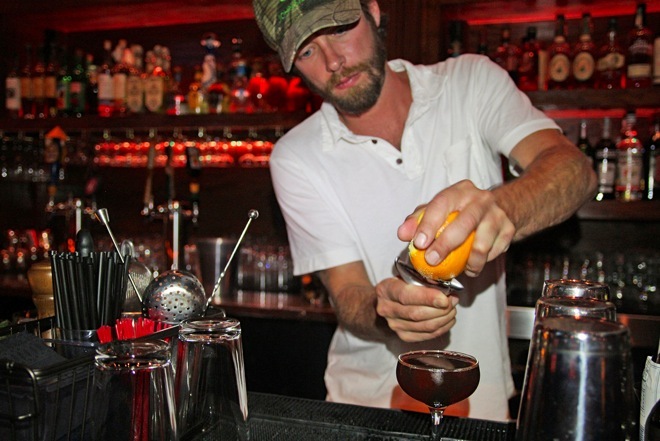 We asked him some quick questions, as part of a recurring Q&A series on L.A. bartenders. Here are his answers. Whiskey. The Grey Goose and Vodka is also quite popular; it’s gin, grapefruit, agave, and lime. I draw my inspiration from the classics and insert modern ingredients which we are fortunate enough to have access to. Any night you come in you will receive the same consistent service from a well educated staff who is passionate about what we’re doing. However, Sundays are great if you’re in the industry as it’s our industry night [offering varying drink specials and a little discount if you’re in the biz], and Tuesdays we’ve got some great bands. I don’t have any hidden talents. I’m quite an open, proud fella so if you know me, then you know everything about me. Where do you like to drink in LA? Anywhere that serves alcohol, but I am quite partial to Harvard and Stone, Mess Hall, the Varnish, and Bar 107. Where’s your favorite place to eat in LA? Red Medicine is the best meal I’ve had in L.A. I also really like Laurel Hardware. Fernet Branca, whiskey, whisky, and beer.